Doctor Who goes epic in this story from Barnaby Edwards which crossover the pace and excitement of an Indiana Jones movie with the adventures from the 1930's and 40's which inspired those movies. As well as borrowing heavily from works of Sir Arthur Conan Doyle, Edgar Rice and Marvel Comics. To be honest, the character names give away what he borrowed from what! But does it matter that its so obvious he has heavily borrowed from other works? No, because this story has been woven so well that the whole things works really well. 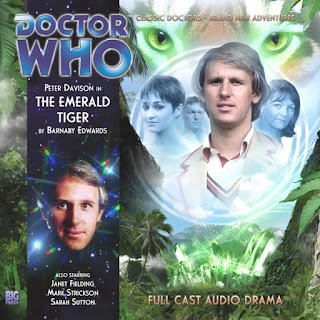 His characterisations of The Fifth Doctor and his companions, Tegan, Turlough and Nyssa feel 100% authentic and everything seems to bounce off the scripted page and into our imaginations allowing us listener to imaging even the tiniest of details. Each of the characters is given plenty to do. At first I thought the writer had fallen into the trap of not knowing what to do with Nyssa so he made her ill so he didn't have to bother with her, but her illness in an important part of the plot without which, these characters wouldn't go on this journey. What happens to Tegan at the end of episode 2 is really shocking and it instantly requires the listener to listen to the next one to find out what happened to her. Never before as a play with this many reunited companions had dialogue that sounded completely authentic. Edwards states that he found their 'voices' easily because he had directed them before but I feel this a disservice to him. Removing Tegan and Nyssa and giving them each their own plot lines in this story also allows for some excellent scenes between the Doctor and Turlough, something that in these reunited companion stories doesn't happen enough. Ultimately The Emerald Tiger ticks all the boxes for what we want in an exciting Doctor Who Adventure. All the guest cast work well as foils for the main cast while Vincent Ebrahim's villain is utterly chilling! My only reservation was the ending which didn't seem completely in keeping with the whole tone of the story but as we would later find out, this revelation did have an effect on future stories so I guess its alright!